More than the next generation of PostBase – it’s an uncompromising vision of professional mailing for the modern mailroom. It makes even complex mailing processes as natural as touching, loading, and sitting back. Sealer which ensures each envelope is sealed for added security. 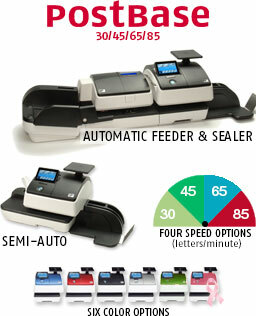 Built-in scale provides precision weighing for thick letters or small packages up to 15 pounds. Dynamic Scale (DS Model) Recognizes envelope size and shape in motion. The biggest member of the FP Enterprise Series. This machine is large enough to handle any mail piece that comes your way. The PostBase ONE has an enhanced, modular design that plays a key role in its ability to adapt to your mailing requirements.